Source: U.S. Energy Information Administration, based on California ISO, Renewables Watch. Note: Small hydro includes hydroelectric generators 30 MW and smaller, which qualify as eligible renewable resources under California's renewable portfolio standard. California also has significant hydro capacity above 30 MW. RPS-eligible biogas is a gas derived from RPS-eligible fuel including biomass, digester gas, and/or landfill gas. Hourly electric power generation data illustrate the variability of wind and solar generation relative to the comparatively smooth output from other generation sources (see charts above). The California ISO, which operates the electric power system for most of California, provides these hourly data for generation sources that are eligible renewable resources under California's Renewable Portfolio Standard (RPS). Power produced by geothermal, biomass, biogas, and small hydro generators can be easily dispatched, meaning it can be either increased, decreased, or controlled to remain fairly constant. For wind and solar, however, generation is largely determined by the availability of the resource. Wind resources, for example, are often more available at night. Solar power is not generated until the sun comes up, and can increase and decrease quickly as the sun rises, sets, or is blocked by cloud cover. However, much of California's utility-scale solar capacity is based on concentrating solar technology, which embodies enough thermal storage to continue generating power for a few hours after the sun goes down (see charts below, chosen to illustrate a variety of wind and solar availabilities throughout the year). The variability of wind and solar power generation leads to challenges in power system operations and planning. The contribution towards total generation from eligible renewable resources also varies seasonally. For the dates charted above, the amount of renewable generation as a percentage of the total generation within the CAISO ranges from 8% on Oct 18, 2011 to 14% on May 9, 2011. As a State, California is trying to achieve a 33% Renewable Portfolio Standard (RPS) by 2020, with eligible resources that include wind, solar, geothermal, biomass, biogas, and "small hydro", which translates roughly as generators under 30 MW (details on eligible resources, which can be located outside of the State of California if certain criteria are met, are written into the RPS). The State of California also has a significant amount (nearly 12 GW) of "large" hydroelectric generating capacity from generators above 30 MW, which are not eligible resources under the RPS. 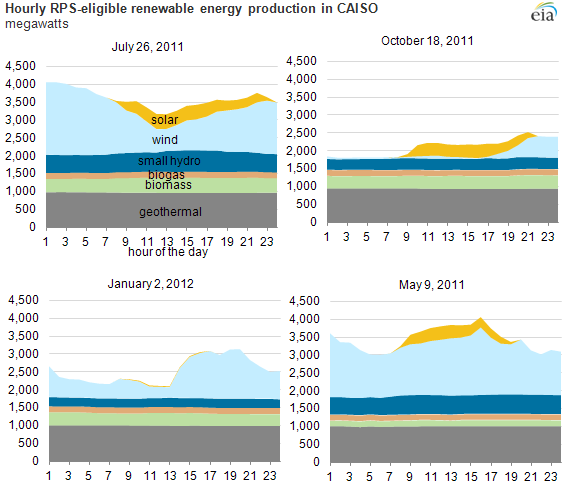 For more information on renewable supply, including context for California renewable generation against hourly demand and hourly total generation, see CAISO's daily Renewables Watch.